The second meetup was hosted by Tim in his spacious studio. 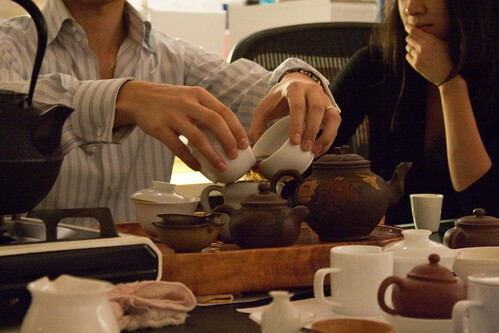 Taking a page from Taiwan tea evaluation, we used a competition tasting cup and spoons to distribute the tea. 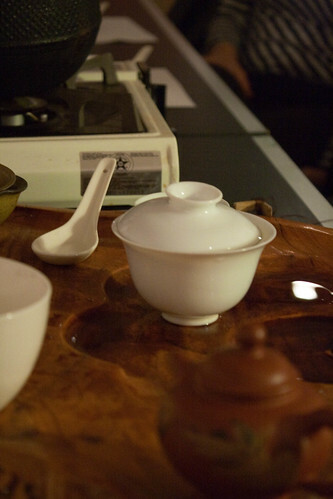 Brewed tea from the pot or gaiwan was decanted into a competition cup, and passed around. Each guest ladled 3 sips of tea into their tasting cup using their own spoon. The spoon could be used to judge the aroma by smelling top and bottom. Mike was first up at the brewing table with a packet of jade TGY from Ten Ren. Sweet and floral, good opener while other guests shuffled in. 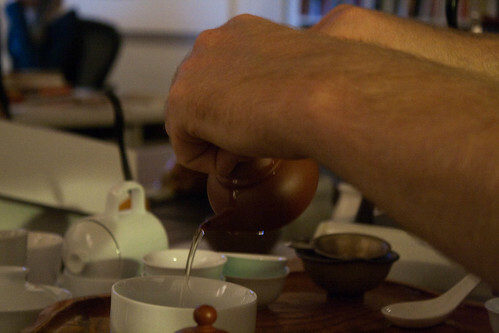 Mike reprised his role as tea master to brew this Feng Huang Dan Cong. Fearing bitterness, we took it a little too easy on this tea. It can be pushed much harder than some Dan Cong. I suggested brewing a few rounds with spring water, which produced a thicker and sweeter mouthfeel versus the filtered water. I took over to brew two aged oolongs. The first I brewed moderately, and I believe it was met with unanimous approval. 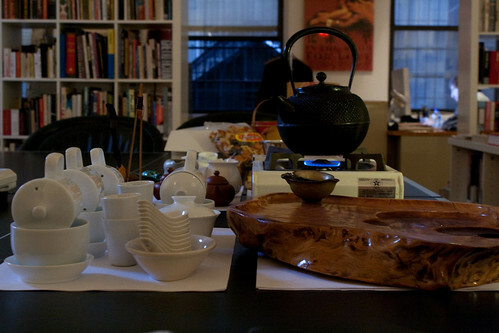 Most compared aspects of the tea to cedar planks, which was more enjoyable that it sounds. Dry leaf in the newly opened bag had a strong cinnamon smell. Some guests smelled cocoa. I decided to brew this second oolong to my own tastes, making it much stronger. Many people preferred this brew, but a few found it to be too strong. Tim flaked off some tea from this 1980 brick to brew in a gaiwan. By now all of the guests have arrived, so he decided to do double brews. Two infusions were combined in my favorite faircup, and passed around in lieu of the earlier spoon solution. 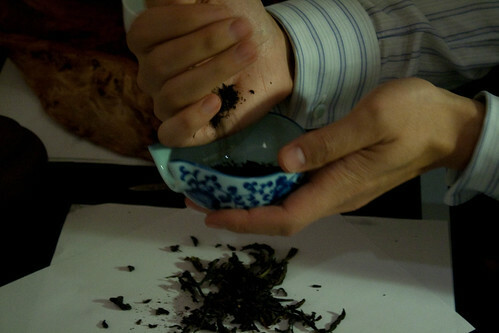 The aroma was described as wet straw, bark, and all the familiar attributes of cooked puerh. The taste was also standard fare. The qi however was very calming and managed to reset the hearts and minds from my aggressive brews. The puerh was a segue into a very limited Yancha from Tim's collection. He carefully demonstrated how to build the pot in three layers. The desired amount of tea was laid out on the first sheet of paper, and whole leaves were selected and moved to a second sheet. A handful of whole leaves was crushed to form the bottom layer of the pot. Reserved broken pieces formed the next layer, and the rest of the pot was filled with the remaining whole leaves. This was a very exclusive tea from a farmer who produces 2 to 4 lbs of this tea a year. It was roasted 8 times, and the taste is very unlike any Yancha I have previously encountered. I don't know whether to attribute this to the skill in roasting, or the age of the bushes. The pot of leaves was left in my care along with a challenge. To brew the tea for 5 minutes each morning, and to refill with boiling water to sit for the rest of the day. Two infusions are to be drunk each day for as long as the tea will last. Anyone who could stay joined us for dinner - we rushed to the restaurant to beat closing time and ordered plates full of "Chinese" food - beef and noodles, seafood pad thai, a delicious eggplant dish and more. We returned to the studio to clean up and called it a night. Before the start of the event, Mike and I ate for lunch at the Bay Leaf and headed to Chinatown for some treasure hunting. We each bought Yixing tea boats and some inexpensive hong ni pots. I found a cast iron trivet to go with my tetsubin. We ate ice cream waffles from the freezer in a Japanese market before meeting up with Tim, who served us large pastries from a Hong Kong style shop. The next morning, I tortured Mike by making him wake up at 6:30 to resume his kung fu cha training. 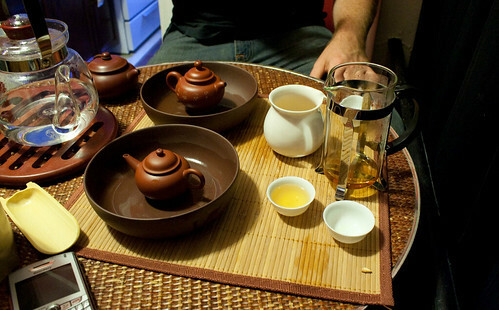 We drank dan cong from a new Chinatown pot, and the first of the prescribed 5 minute Lao Cong brews. Before we could brew much more, I had to catch the subway towards Penn Station and make my way home. But after a long, dry winter, I set some puerh out in the sunroom to enjoy the wet weather.